What B2B thought leader predicted personalization was not going to be among your 2019 marketing strategies? Correct, that is a trick question. Everyone predicts personalization, or 1-to-1 marketing, will be among the B2B marketing trends this year and probably the foreseeable future, too. So, why do 76 percent of North American marketers rate their personalization as either basic or absent? That was a finding in Dynamic Yield’s 2018 personalization assessment that surveyed more than 700 marketers worldwide about their personalization efforts. Another key finding was that 30 percent of North American marketers claim to have no processes whatsoever for personalization and 26% have zero personalization technology. And according to Adweek, only 12 percent of advertisers feel their personalization strategies are performing well. Making matters more challenging is just the sheer enormity of content being created. According to WordPress.com’s dashboard, more than 70 million new posts are created each month. Well, if you have a website, a CRM and an adaptive marketing platform, like Act-On, you have plenty of marketing personalization opportunities you can take advantage of. Let’s review 7 of them to help you stand out from the noise. 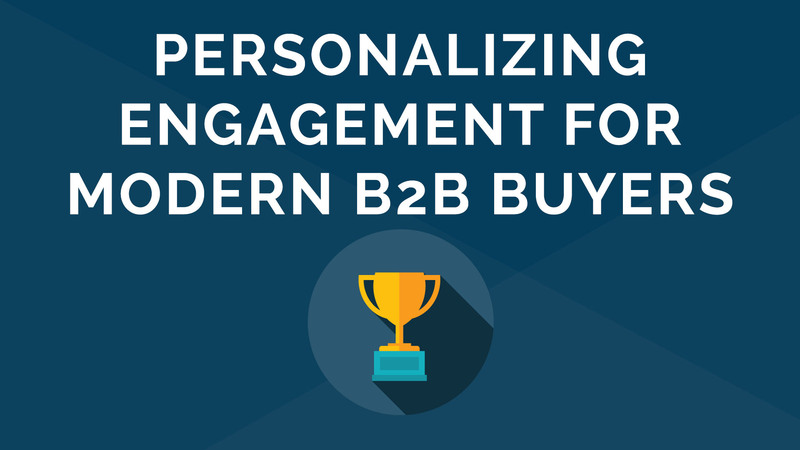 Why adopt personalization into your B2B marketing? Let’s begin with a definition of personalization. A lot of sales people will tell you we’ve being doing personalization for decades. And that is true. When we interviewed Tom Hoffman, former CEO of RM Hoffman, to learn about their success using Act-On, he talked about how sales were done when his father started the company in 1959 (it has since been sold and is now a division of Motion Solutions). Today, we live in a global economy where your customers can shop 24/7 on the internet. You can’t rely on a sales person walking door to door, handing out catalogs. You need to be always available. You need to scale. Today, personalization in your marketing, either B2B or B2C, is when you leverage the data you have about your customers and targeted customers, whatever that may be, and combine it with technology to offer your products or services in a personally relevant way. According to McKinsey, personalization can reduce your acquisition costs by as much as 50 percent, lift revenues by 5-15 percent and increase your marketing spend efficiency by 10-30 percent. And the addition of machine learning and AI will enable “smart personalization engines” to increase revenues another 15 percent by 2020, according to Gartner. I write about this in most of my posts, but I can’t stress the importance of really knowing who is your audience. Most successful marketers have a developed, documented buyer personas. To be able to sell to your audience, you need to be relevant to that audience. You need to know their pain points, fears and desires. You need to be able to speak their language. If you’re doing that, and you’re making some sales and collecting the data from those engagements (via your marketing automation and integrated CRM), then you’re able to really get started with personalization. That’s right, even with the hottest new AI-powered MarTech, you’re still going to need your data to deliver a personal experience to your buyers. No silver bullets. You’re going to have to roll up your pant legs and wade into your customer data. Buddy up to your CRM guru and ask her to guide you on what are all the data points you collect from your customers and would-be customers. What other data sources do you have? And don’t settle for looking at just the demographic data points. I think personalization also means delivering content to your customers and prospects before they even know they need it. This is what Amazon and Netflix do with their recommendation engines. Figure out a way to make your own recommendation engine with the data you already have. Look for seasonality or other trends in your data. Is there a time in the year when they are downloading a particular eBook? What do they do next? Watch a webinar or download another specific eBook (look for correlation and trends). Is there particular video relating to your pricing or product comparison that is being watched around the third quarter? How successful were your previous offers? Why do you think that is? What offers did customers respond to most? Why do you think that is? Which offers had the highest conversion rates in previous years? Why? And don’t stop at just the data you have in your CRM and marketing automation platform. Look elsewhere, such as the native analytics being tracked on your social media platforms, your Google Ads and Google Analytics data and so forth. Regardless of the tools you are using, you need the data. Do you have enough? It is important to think about personalization in the beginning of any marketing initiative or campaign. With the website beacon installed, your marketing automation platform is tracking and recording information about visitors to your website. But you’ll also want to convert those unknown leads into known leads at some point. You get that information from forms (and a chat bot is essentially an interactive form). As I have written about in the past, it is important to only ask for what you need to know at that point in the engagement and based on the value of the content for which you are exchanging that information. But I have rarely met a marketer or sales person that didn’t want all the information they could get from a prospect, including next of kin. You can eliminate form friction by using progressive forms. Consider it a happy compromise to getting all the information you want, but at a pace your prospect will be more comfortable in giving it. So, an unknown visitor wants an eBook, they provide their first and last name and company email address. Next time, they want to attend a webinar, they have to give their company name, and industry. If they want to watch an on-demand webinar, they have to give the size of their company, and their annual budget for whatever good or service you’re selling. This does a couple things to make a better personalized experience. First, I don’t know about you, but I hate it when a company I am engaging with asks me to fill out more than a few fields, and more so when they ask me to complete those same fields over and over again whenever I want more of their gated content. Note to everyone doing that: stop asking for the same information each time. Ask something different, even fun. Second, progressive forms lets you get more robust data about your prospects that can later be used for better personalization. Once you’ve collected what you need to know about your customers, let’s start using it to create marketing segments. This is where you can separate your company from all those still emailing to one master marketing list. That approach just results in tone deaf messaging. You can still keep the master list, but create segmented lists under it that you can leverage in your marketing campaigns. At Act-On, we sell into the finance industry, manufacturing, and insurance to name a few. The credit union marketer doesn’t want to watch a customer success story video about a manufacturing company. Segmenting allows you to slice and dice your lists based on the data you’ve collected so that each group gets messaging that is relevant to them. Personalized triggered messaging, such as emails, are “triggered” when a visitor takes a specific action on your website or other content. They are personalized, using the information you’ve already collected about them. And they are sent in near real-time, so they are relevant when your visitor is already engaged. At Act-On, we’ve seen email open rates 75% higher than business as usual marketing messaging, and click-thru rates 119% higher. But you can create triggers events if someone visits a specific landing page or key page on your website (say pricing). If you’ve done your homework in analyzing your data, you may know that most people who download a specific eBook have also watched a related on-demand webinar. You could create trigger events for each activity recommending the other. You can create trigger events if a customer hasn’t been active with your business in a while. This works for B2B SaaS companies that have a technology platform, as well as for B2C gym memberships. They won’t renew those contracts if they don’t feel they’re using the product or service. In simple terms, if you are familiar with If This, Then That statements, then you’ll be a natural at creating personalized trigger emails. On first appearance, automated nurture email campaigns may not be the most personal of messaging. But when you pull all the levers and ring all the bells, they can be a dynamic personalization tool. Begin by creating campaigns for specific segments of your audience. That’s what Marc Wilensky’s team did at Tower Federal Credit Union, a $3 billion organization based in the Baltimore area. Wilensky, vice president of Communications & Brand Marketing, said they created an automated nurture program targeted to their members that may be considering purchasing a new car. They launched the campaign during the fall 2017 holiday season, a time when most new cars are purchased (and thereby most vehicle loans issued). What amazed Marc and his team wasn’t just the initial open rates of the campaign’s first email, but the engagement with the second and subsequent emails that were the most impressive. The success led Tower to create segmented nurture campaigns for mortgage loans, and wealth management, too. I haven’t mentioned this already, but you should be utilizing dynamic fields in your emails, including in subject lines. Too many companies have screwed this up, so make sure you have more than just one person create, review, and test your emails before you send them out. You don’t want you brand ridiculed on social with [insert first name] gaffes. Besides testing those nurture emails to make sure you have the dynamic fields correctly set up. You’ll also want to confirm your data is good, too. A misspelled name can happen when you customer originally completes fills a form. One way to proof what they’ve provided is to send them a confirmation email that repeats back what you have, asking if everything is correct. You can also include a link or links for them to manage their profiles and subscriptions. Dynamic content can also be pulled into landing pages associated with an email campaign and its call to action. I know I pay more attention when I see my name on a splash page telling me, “Hey Nathan! Here’s an on-demand webinar that we think you’ll love.” And you can write that confidently because the data tells you that. Tapping into your data again and Act-On’s ABM tools, you can create trigger events or nurture programs that personalize your messaging to the people within an account or targeted account. For example, I watch attend your monthly webinar. That triggers an email follow up that recommends an on-demand webinar that others at my company have also watched, or it recommends an eBook or datasheet that others in my company have also downloaded. Buying decisions, especially B2B buying considerations, are involving 5+ people. How much better will that conversation go when everyone in the room as seen the same data sheet, on-demand webinar or other content. Or put another way, how much easier will that sales demo go when you know they’ve all watched or downloaded the same material. This post would be too long if I wrote about all the different personalization tactics you can employ relatively quickly. But I did want to plant a seed for a couple more options that we can discuss in the future. You can build in subtle personalization into your website, whether on your home page or other top traffic pages. This can include adding in some code that reveal different imagery or other content based on different specific factors. For example, I’ve tried this with the iconic Portland Oregon neon sign. Depending on the time of day, you would see the sign with blue skies in daytime and lit up in a dark sky at night. Personalized videos are another great personalization tactic with which we’ve had success. Partnering with Vidyard, we’ve created personalized videos for our customers, mid-funnel prospects, as well as prospects that had grown cold. If you don’t have the resources to create a personalized video, but you do have a video library, you can create a “choose your own adventure” series of videos. This can be done in a fancy way with custom landing pages and scrolling videos. Or you can use call to actions at the end of the videos that give a viewer a choice of paths. For example, you could watch our 60-second overall intro video about Act-On. And from there I could give you a choice of watching videos about our CRM integrations or watching videos about automated nurture programs. From there you could have more choices. This wins for a couple of reasons. First, the viewer gets to watch only the videos that interest her. Second, your sales team gets to see this engagement history via your marketing automation platform, your video hosting platform and your CRM. So when she becomes a Sales Qualified Lead, the rep knows specifically what benefits to talk about with your product or service.